The benefits of music are pretty well known by now, and applied in many different fields of daily life. There are benefits for senior citizens as well as for people able to experience ASMR. We have even looked at the question whether it’s good for you to listen to music while working. But did you know that music can also be a very powerful tool for teaching children? Songs with empowering lyrics and easy understandable words can help children to grasp bigger concepts and help them deal with certain situations like loss of a pet, nightmares, or others. Language learning is facilitated as well. But overall, listening to music and accompanying activities show a very positive effect on a child’s performance in school and social relationships, and enables them to handle conflicts better. Furthermore, happy and uplifting music is said to also be able to enhance a child’s cognitive ability. Every nation and every language has it’s own exhaustive collection of children’s songs. But which songs are the perfect ones for which purpose? Especially work in kindergarten revolves around the different seasons and festivities throughout the year. Many songs for children and music in general (take, for example, Vivaldi’s Four Seasons) pick up such themes, making it easy to draw connection to the other lessons and learning content. Happy tunes during springtime, or more calm and solemn music during the winter generate a cozy and comfortable atmosphere during painting and drawing lessons or relaxation and sleeping times. 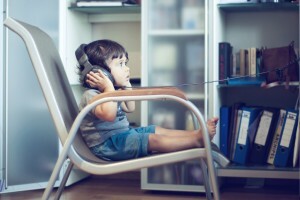 Popular and well-known children’s songs are popular for a reason. They oftentimes already provide a learning value through their lyrics and can easily be sung or played by parents and grandparents as well, transferring the learning effect from school and kindergarten to the own home. In kindergarten, it’s typical to have nap and story time whereas in elementary school calming times with relaxation or time for drawing take over. All of these occasions have in common that they call for un-disturbing and un-distracting background sounds instead of songs filled with lyrics and many changes in rhythm and pace. In contrast to these calming occasions, the music during sporty activities should be more upbeat and encouraging the child to move along to rhythm and sounds. Adding sound effects like a whistle, a bird’s call, or a loud drum can act as a signal to change directions in running around or be a cue for the children to do certain activities like jumping, lying down, spinning around in a circle once, or something similar. Overall though, the music should be one thing for sure: something the children can like and enjoy. Not many children find the liking in harsh, scary, or disturbing sounds.